We are always on the search for that perfect neutral. 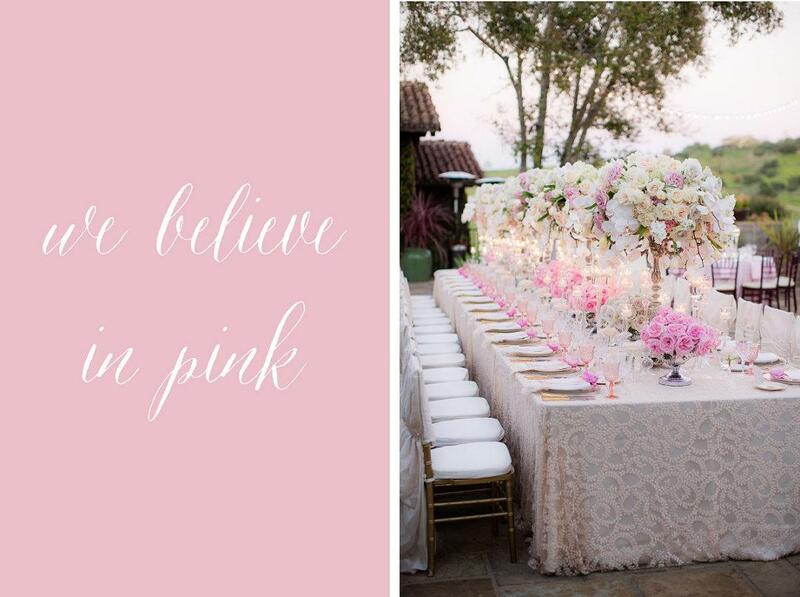 Be it a light shade of blush or a golden shade of champagne, there’s the right neutral tone for every event. 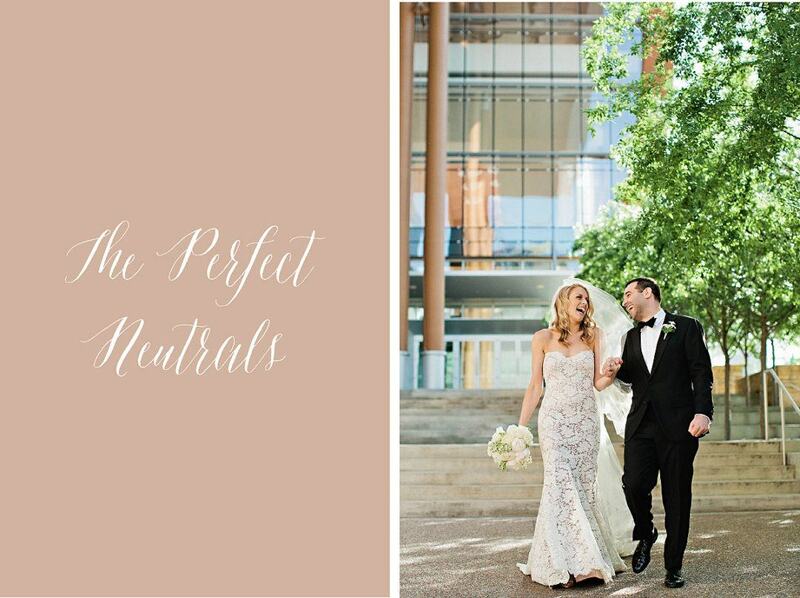 So when Jenny Corts, of Jenny Richter Special Events, shared this Country Music Hall of Fame wedding with us, we were so in love with the combination of neutral hues that came together like magic! 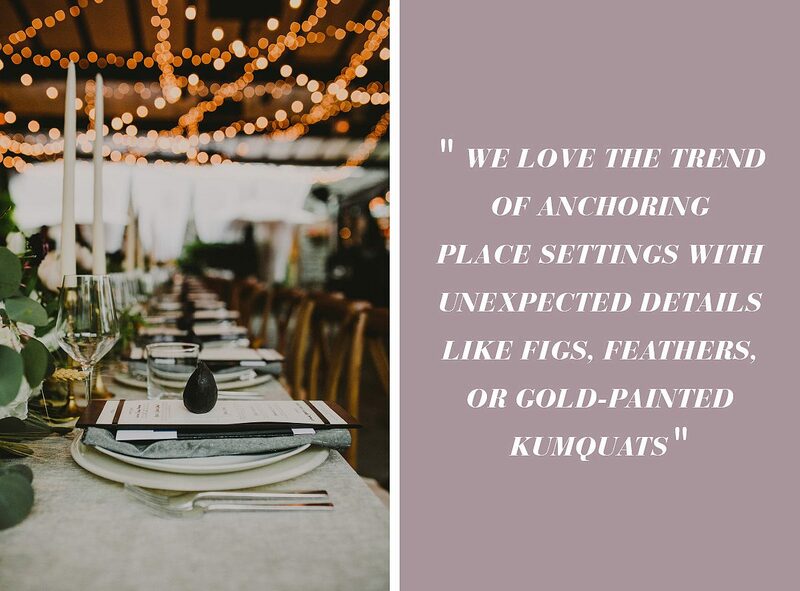 The wedding was set in a palette of warm champagne tones, with high back sofas lining the room, tables dressed with the Sand Web alternating with the Goldmine Faux Dupioni and sunset streaming in at just the perfect moment – captured perfectly by Kristyn Hogan. A simply elegant cake, from Dessert Designs by Leland, sat a top the Blush Scalla, adding a tinge of blush to the night. Our favorite thing about a netural palette is how it gives flowers the space to shine! Branches Event Design & Florals brought in pretty pops of color in the centerpieces, from bright corals to lush greens, to brighten up the room. 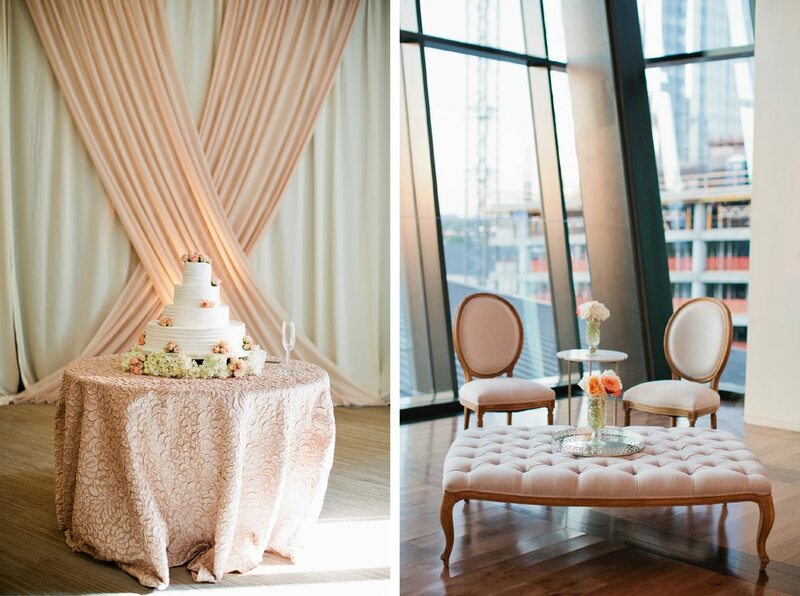 From the perfect palette to the dreamy draping, this event really just came together beautifully. And we’re not sure if someone planned on that golden hour light streaming in, but we definitely want that one at our wedding too! There’s just something about the color pink, in all of its many shades that we will always love. From light hues of blush to deep shades of fuchsia, it just magical to us! So what happens when Karen Tran takes lots of lovely pink things, such as vintage glassware, sequin overlays and many, many roses and puts them all together at The Santaluz Club? Basically it’s the prettiest event that you have ever seen! The Youngrens captured this magical night, pink glow and all, so scroll through and find out why we’re seeing the world in a whole new –pink- light after this! Are you as obsessed as we are? Find more rose-colored inspiration here, in our lookbook! The tabletop was just incredible! Gretchen mixed unique textures, from the black leather linen to the pink chiffon draped chair backs, giving the design an elevated feel. The centerpiece, an amazing arrangement of red flowers crafted by Rocket Science Weddings, is a true statement piece sitting on Event Lab’s tall stand. Gretchen Berry’s unique menu design laid a top of The Festive Frog’s pink glass plates and black & white Monique Lhuillier plates from Ultimate Events made for a gorgeous stack – almost too pretty to eat on! 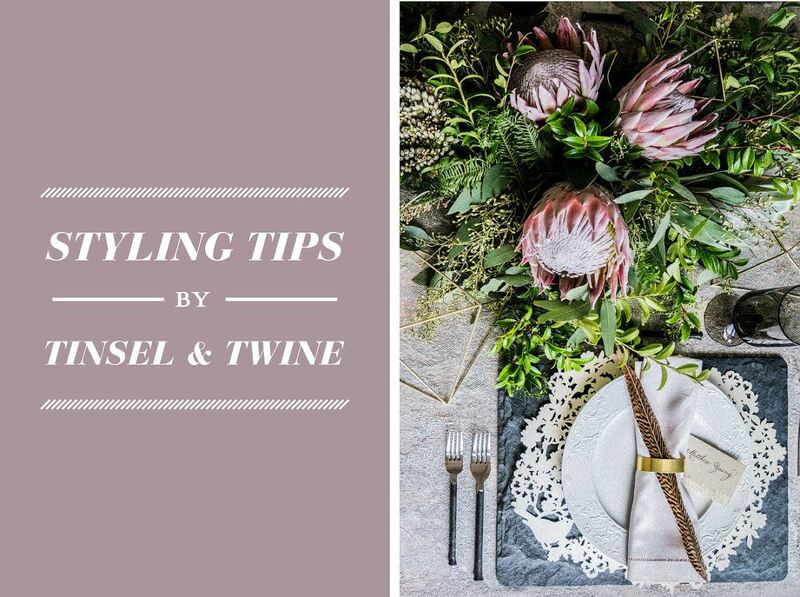 Top Styling Tips by Tinsel & Twine! 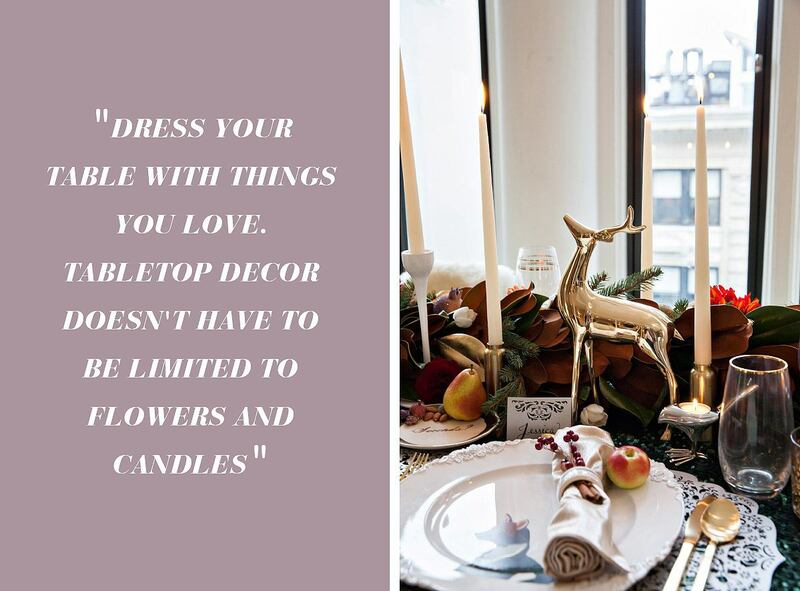 Have you met the ladies of Tinsel & Twine? Liz Castelli, Adette Contreras and Erica Taylor are the girl bosses behind the Brooklyn-based event design and production studio that concepts and creates dream atmospheres for everything from weddings and bar/bat mitzvahs to experiential marketing activations. We’ve been long-time fans of their work, finding ourselves completely in love with their grand ideas and their attention to detail. We had a chance to hang out with this all-star trio and pick their brains on how to decorate like a pro. Scroll through to find out their top styling tips that’ll make every party you throw a hit! 1. People usually gravitate towards burlap for a more rustic event, but we always recommend something with a bit of sheen and metallic threads to help elevate the table. The texture is still there but with the added glint of candlelight. 2. 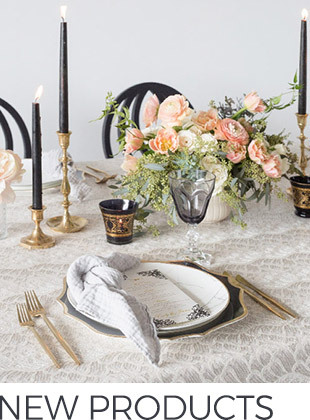 We love the trend of anchoring place settings with unexpected details like figs, feathers, or gold-painted kumquats. Something as simple as a palm frond or gemstone goes a long way as a unifying design detail. 3. 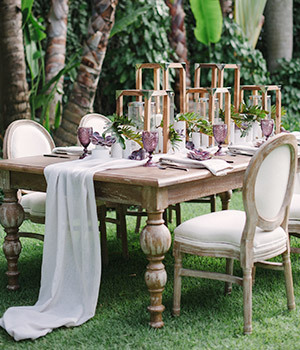 Luxurious textures and tabletop details with some weight help otherwise rustic tables from feeling too casual. We like to incorporate elements like statement placemats and chargers in heavy, traditionally masculine materials like slate, leather, or hammered metal. 4. 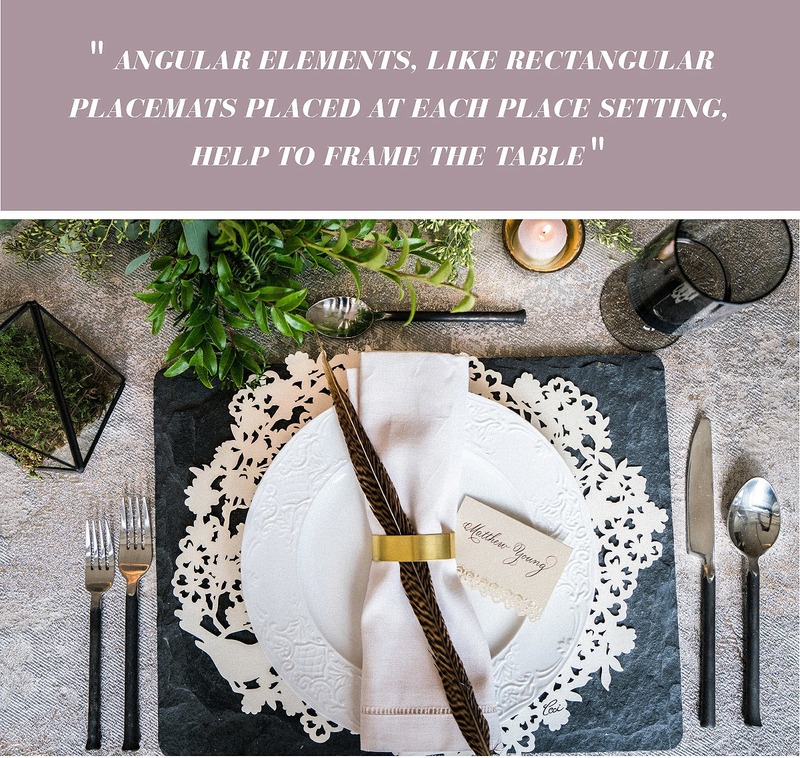 Angular elements, like rectangular placemats and long menu boards placed at each place setting, help to frame the table. This is especially important with free form, organic floral arrangements and garlands. 6. 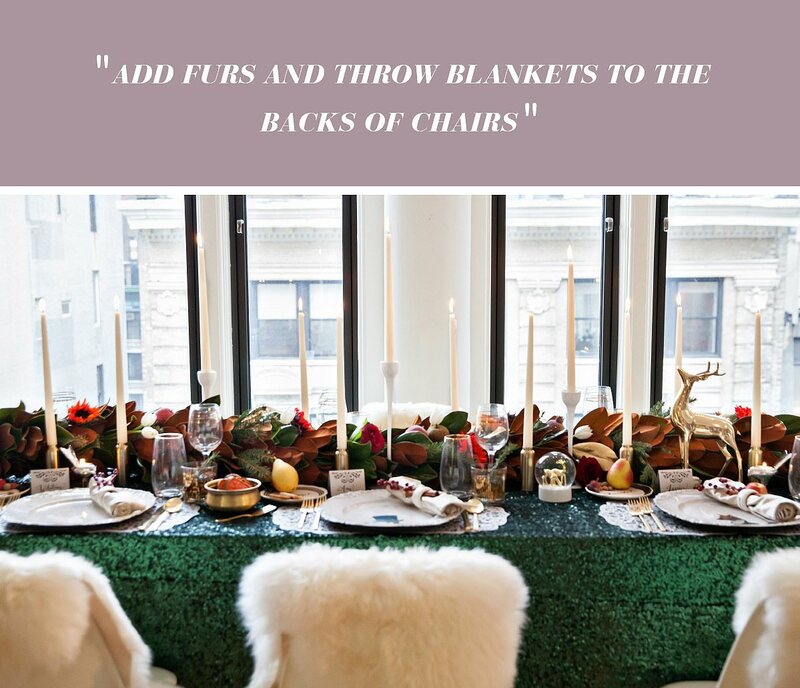 Add furs and throw blankets to the backs of chairs to create an extra cozy environment for guests — especially for an intimate, winter party. 7. 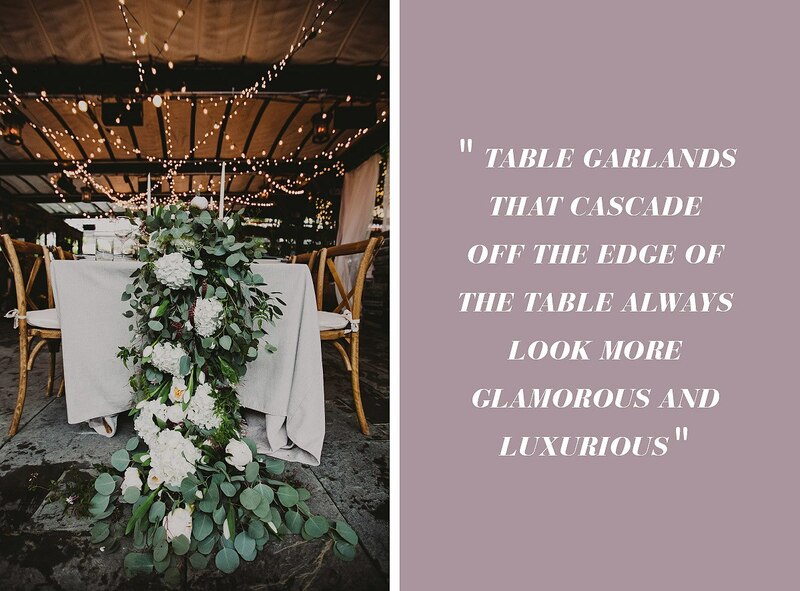 Table garlands that cascade off the edge of the table and pool onto the floor always look more glamorous and luxurious. We love this technique for dressing up dinner parties or making a statement at a head table. 8. Dress your table with things you love. Tabletop decor doesn’t have t be limited to flowers and candles. We encourage clients to explore objects and themes that bring them joy. Think: miniature statues and figurines, snow globes, books, framed artwork. 9. 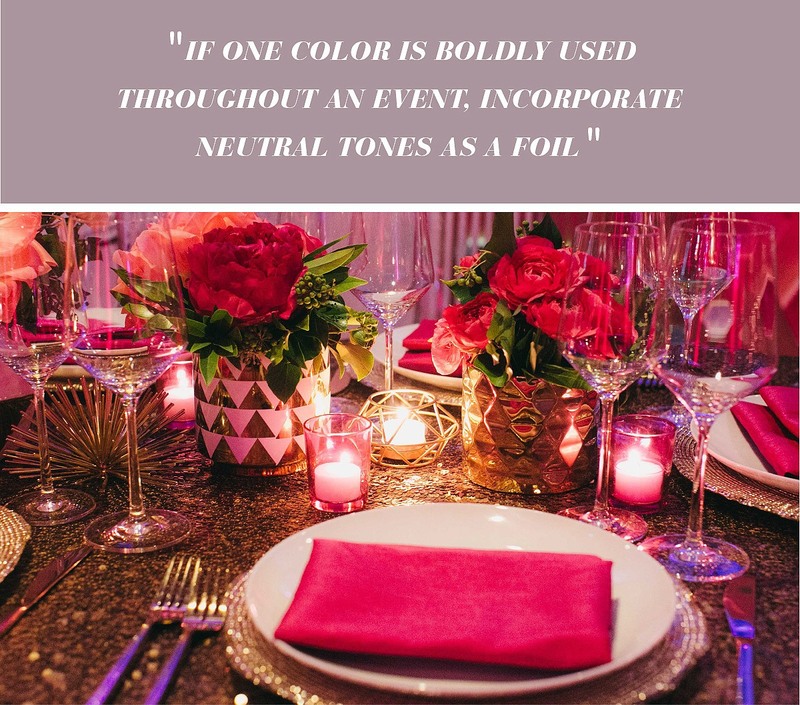 If one color is boldly used throughout an event — i.e. 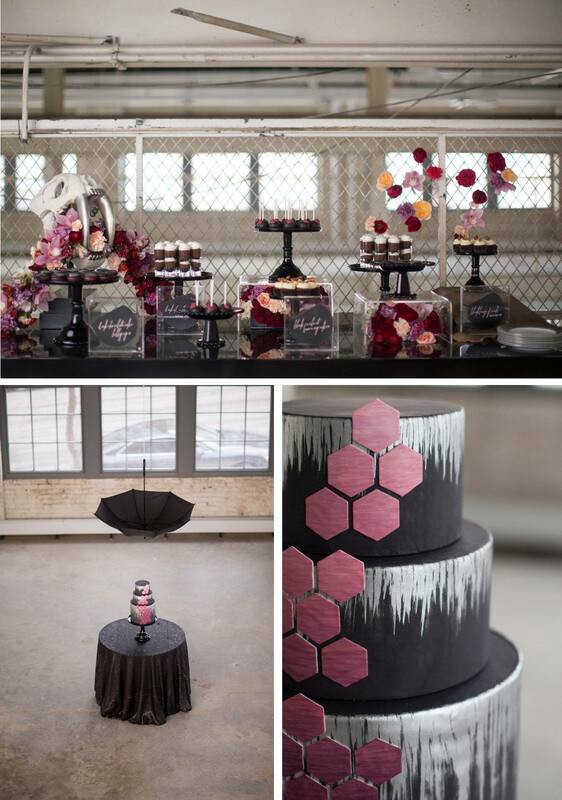 hot pink up lights, hot pink balloons, hot pink flowers — incorporate neutral tones as a foil. To balance blocks of color, we recommend more sophisticated choices in linens, vases, and room furnishings. 10. Never too many candles! Place votives and hurricanes in mixed heights and materials for a million points of light to warm up any space. 11. 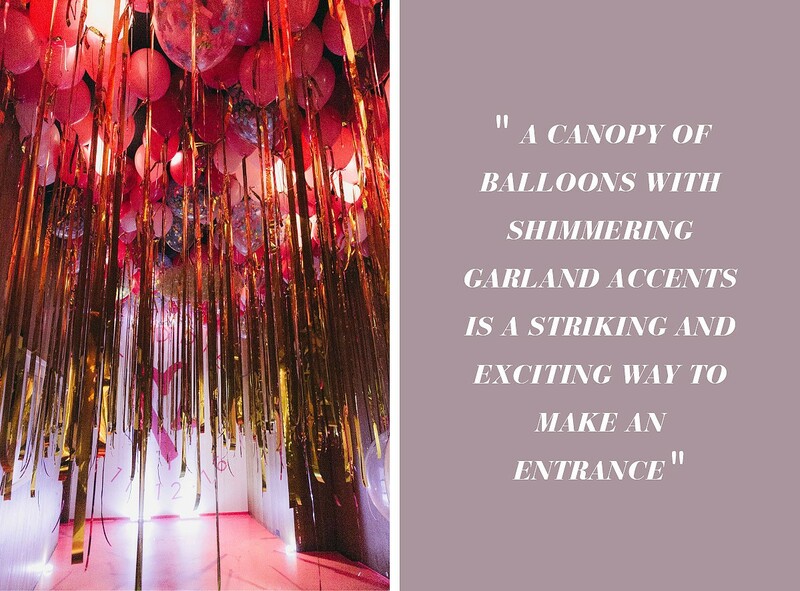 A canopy of balloons with shimmering garland accents is a striking and exciting way to make an entrance. 12. Once you establish a visual theme, explore ways to incorporate those details in unique but complementary ways. For example, use a geometric theme to explore various lines, patterns, shapes, and sizes through vase selections, tabletop details, lighting patterns, linen choices, and plating. 13. Our newest obsession is using vinyls to give a new look to floors and walls. We especially like taking inspiration from textiles or other familiar surfaces to create new (and temporary) environments. Think: Vinyl of an oversized oriental rug for a dance floor, log cabin walls, or an ombré gradient aisle runner. Take notes because these ladies are in the know and always creating new trends with it comes to styling. 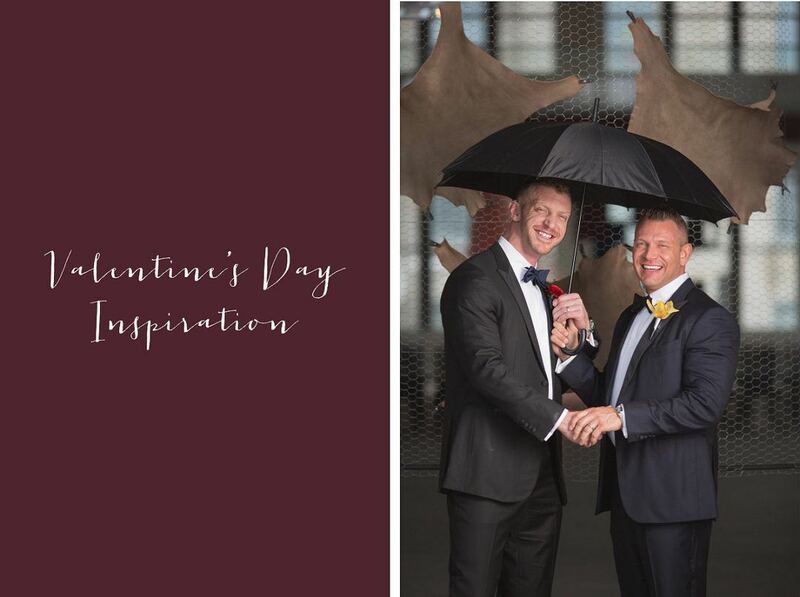 Keep up with their latest endeavors via Instagram where they are always posting inspirational event eye- candy!